Fólkvangr is called where Freyja decides the seat choices in the hall. Every day she chooses half the slain but half belongs to Óðinn. There is some ambiguity in the name Folkvangr, because it can mean either something like “People-Field” or else “Army-Field”. (Lindow: 118) Given that it holds half of those killed in battle, most people incline towards the latter interpretation. If so, Folkvangr would be an alternate Valhalla. We know from Sorla thattr that Freyja was commanded to stir up the eternal combat between two evenly matched lords, which could link up with the continual battle-practice at Valhalla. (Lindow: 174) There isn’t anything else in the sources to support the idea of Folkvangr and Valhalla being the same sort of realm, however, so it must remain speculative. Viking burial stone ships, Lindholm Høje, Denmark. 1000-1200 AD. From Tumblr. Stone ship burial from Anund, Sweden. The stone-ship burials spread to the island of Gotland about 200 years later. During the Iron Age shipbuilding technology improved dramatically, and people were able to build the light, fast ships that allowed the Viking Era raiding and trading to take place. Stone ship burials changed, with both small ships and a newer, large ship model built from large stones or boulders set in an oval. These new-style, larger, ship burials were exposed, unlike the earlier ones which were always mounded over, and they seem to have spread across all of southern Scandinavia. The other aspect of the newer ships was inequality: in both art and life there are the rowers, and the styresman. Also, men could be “called up” to serve as rowers, and were taxed to pay for voyages and shipbuilding. All this goes to show that ship burials were very much associated with the elite. The elites who owned ships and compelled others to pay for them and row in them, were the ones who set up the picture stones showing warriors and warships. As such, it would be appropriate if Freyja’s hall was a stone ship, in a field. Nehellenia with oar and ship. That is not to say that Freyja “is” the Isis Tacitus was writing about; but that elements of her cult might have been similar. 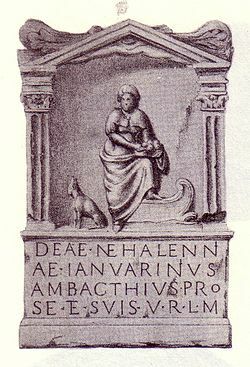 (Nehallenia is a good candidiate for Isis, as her oar attribute indicates.) They go on to suggests that since Indo-European beliefs about the afterlife include both a water element and a field (the Elysian Fields, for example), the Vanir might be far more involved in the afterworld than we knew. A further afterworld – water – Vanir connection may relate to Njörð. Freya’s home, Folkvangr, has echoes in the Eddic himinvangar ‘fields of heaven/sky’ and hebenwang. Other names for paradise include Gothic waggs, and Old English neorxanwang. (Hopkins and Þorgeirsson: 15) There have been many attempts to connect this last to Njörð, either as coming from the same root as his name or else as a field for Njörð. If this were true, and Nóatún was Njörð’s hall within whatever the Old Norse for neorxanwang would be, that would establish a strong connection between Njörð’s realm and his daughter’s, with both as afterworlds. (Hopkins and Þorgeirsson: 17, n. 5.) It is ironic that Njörð did have a paradise at Nóatún, Skadi had no desire to live there. Dubois points out that neither Njörð nor Þor seem to have any interest in housing the dead, unlike Odin and Freyja: “Not all Scandinavian gods appear interested in hosting the dead, even if their halls are known to men and wondrous to behold,” (Dubois 1999: 80.) On the other hand, Harbardsljod seems to imply that while Oðin gets the aristocrats, Þor gets the thralls after death. Another possible derivation for Njörð’s name, is connected to the word “north”, and the Greek νερτερος, nérteros “lower, nether (world).” (Shields: 219, McKinnell: 51) This in turn comes from the root *n(e)r-, meaning “under” and an adverbial affix *t(e)r-o-. (Shields: 219) As I mentioned in my post on Idunn, the idea of an otherworld located in the north, such as Glaesisvellir and Údáinsakr, was a common idea in Germanic thought. If Njörð’s name comes from either “north” or “underworld”, then either way he can be connected to afterworld myths. 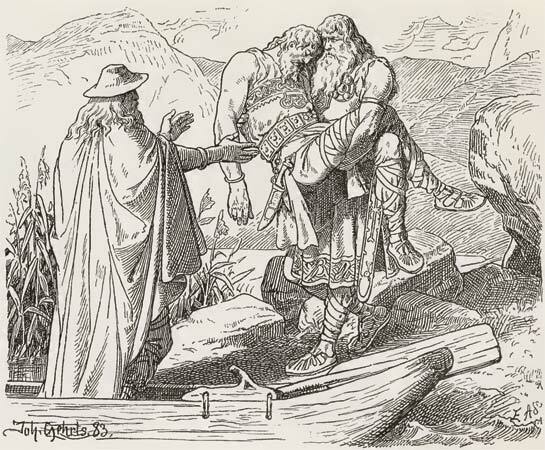 While it may seem strange that so much marine symbolism attaches to Freyr when Njörð is the god in charge of sailors and fishermen, Simek suggests that as time went on, Njörð’s importance decreased, and many of his associations became attached to his “stronger” son. (Simek 1977: 36.) Since Freyr was a fairly major deity at the time that this material was being written down, it is intriguing to speculate on how important Njörð was in the Viking and Brone Age past. So we know that the Vanir, and especially Njörð’s children, Freyr and Freyja, had a connection with ships and the afterlife. The other major incident in the Eddas to do with ships and burial is Baldr’s funeral, which has all the features we associate with a Viking burial, with the burning ship being pushed out to sea. It seems that Baldr was destined for Hel, which seems odd for Oðin’s son, but we know from various sources that he was there. In other parts of the Indo-European world we can find beliefs about the afterlife that match up to those of the Norse. The ferryman of the dead, the journey across water, and the field or meadow of the dead, can all be found in other mythologies. Oðin’s role as ferryman is echoed by Charon, who also is figured as a white-haired man. (Oðin’s role is also taken by the giant Hyrmir, whose beard has icicles in it, and who, unlike Oðin, does row Þor out to the ocean.) Lincoln sees Hyrmir as another version of a white-haired ferryman of the dead. There is also the Celtic Barinthus, whom Brendan the Navigator meets, and who also appears in Arthurian legend as the one who takes him to Avalon. Barinthus has been reconstructed as Barfind, or “white hair”. (Lincoln 1980: 67.) Lincoln also finds similar imagery among the Slavs and in the Vedas. Equally, there are many examples of a field or meadow where the souls of the dead reside. The Elysian Fields, and more broadly, the IE root for “die”, derived from ON valr, Lith veines, TochA walu, may be formed from the same root as the IE root for pasture, i.e. Slavic Volosu “cattle god”, Hit, wellu “meadow”. (Mallory and Adams: 153) Thus Folkvangr and neorxwang fit into a larger tradition, along with possibly Glasesisvellir and other paradises. Of course, when most people saw a ship go by, their thoughts were probably more mundane than this. They saw a chance for riches, either through long-distance trade or raiding, or the possibilty of travel and adventure, or, more negatively, impressed labour and a burdensome tax. Ships and boats were part of the fabric of everyday life, as well as carrying a mythic freight. After all, if Bruce Lincoln could write two papers on symbolism and ships, one of which concerns the ferryman of the dead and the other the mercantile and social aspects of ships and shipbuilding, then clearly the symbolism is many-sided, and takes in both this world and the other. The Prose Edda Snorri Sturluson/Jesse Byock, Penguin Clasics, 2005. Germania and Agricola Tacitus/H. Mattingly, Penguin, 2010. Davidson, H. R. E. 1968: The Road to Hel: A Study of the Conception of the Dead in Old Norse Literature, Praeger (reprint). Dubois, Thomas 1999: Nordic Religions in the Viking Age, University of Pennsylvania Press. Hopkins, Joseph S. and Haukur Þorgeirsson 2011: “The Ship in the Field,” RMN Newsletter 3: 13-8. Lincoln, Bruce 1980: “The Ferryman of the Dead,” Journal of Indo-European Studies 8: 41-59. Mallory, J P. and Douglas Q. Adams 1997: Encyclopedia of Indo-European Culture, Taylor and Francis. McKinnell, John 2005: Meeting the Other in Norse Myth and Legend, D. S. Brewer. Rønne, Preben 2011: “Horg, hov and ve – a pre-Christian cult place at Ranheim in Trøndelag, Norway, in the 4rd – 10th centuries AD,” Adoranten: 79-92. Shields, Kenneth 2008: “Some Comments about Early Germanic Cardinal Direction Words”, Historische Sprachforschung / Historical Linguistics Bd. 121 (2008): 219-225. Simek, Rudolf 1977:”Skíðblaðnir: Some Ideas on Ritual Connections Between Sun and Ship,” Northern Studies 9: 31-9. 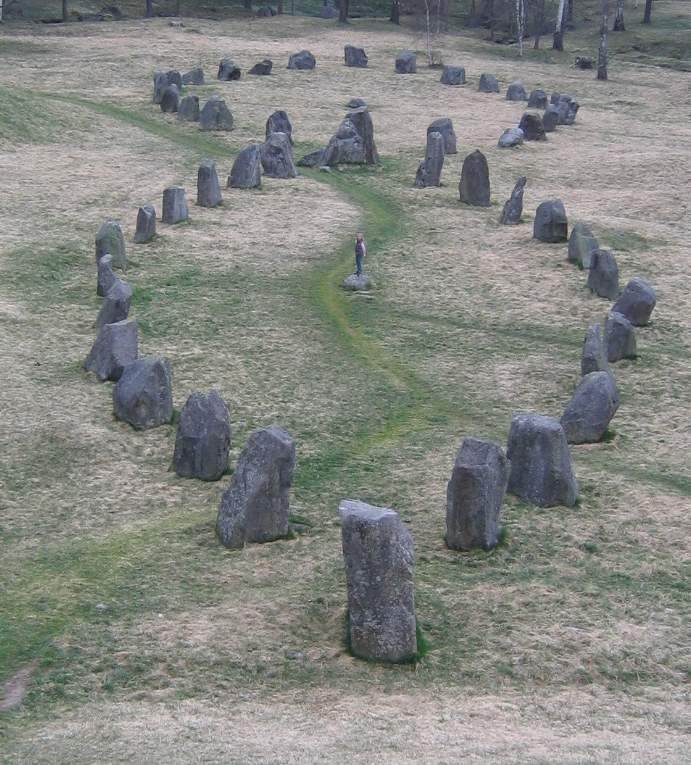 Skoglund, Peter 2008: “Stone ships, continuity and change in Scandinavian prehistory,” World Archaeology 40:3, 390-406.